Carl Friedrich Freiherr von Reichenbach, discoverer of the paraffin, was a keen German philosopher and natural scientist of the early 19th century. His passion for meteorites awoke with the fall of the Blansko meteorite in today’s Czech Republic which occurred in 1833. 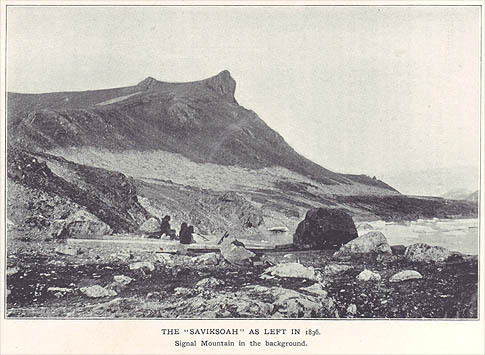 Reichenbach, who at this time worked as a chemist in the smelteries of Baron Salm in Blasko, had his workers search for the meteorite several days before it was found. 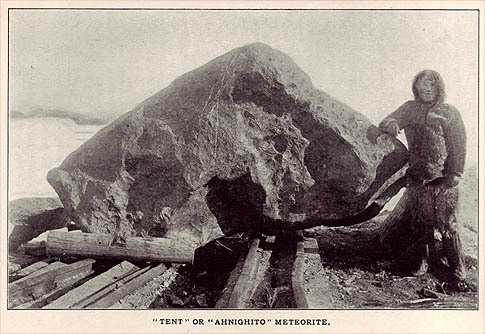 The event was the seed of what would become one of the largest private meteorite collections of his time. After Reichenbach had become the first to isolate, describe and name the “Kamacit” as a member of the Widmannstätten structure he turned to describe the “band iron” and the “filling iron” in the present 1861 article. After he had mechanically isolated, chemically analyzed and described the band iron Reichenbach suggested the term “Taenit” for it, derived from the Greek word for “ribbon or belt”. For the filling iron Reichenbach introduced the term “Plessit”, after the Greek word for “to fill or to replenish”. This is the first mentioning of the terms in the history of meteoritics. For the optical exemplification Reichenbach used the two methods common at his time to visualize the diferrent components: etching with diluted acetic acid and heating and subsequent analyzing of the annealing colors. The chemical analysis of the metalurgical components was provided by Reichenbach’s son, also a respected chemist at that time. His findings suggested among others the relative high Ni content of the taenite component. 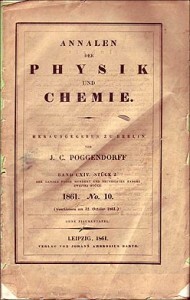 The 1861 volume of the “Annalen der Physik und Chemie” also includes the first publication of the confirmation of nitrogen in meteoritic iron (Boussingault: Stickstoff in Meteoreisen, S. 336) Boussignault, inspired by the results of French chemists who had recently detected nitrogen in artificial steel, conducted his successful experiment on a sample of the Lenarto meteorite. He found it to contain 0.00011 volume percent nitrogen. nebst Bemerkungen über die Rotation der Meteoriten im Fluge. Von Hofrath W. Ritter v. Haidinger. 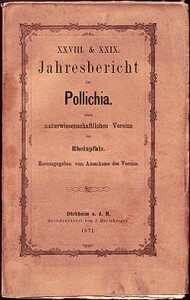 In: Sitzungsberichte der Kaiserlichen Akademie der Wissenschaften, Vol. LIX, IV. and V. book. Vienna 1869. While continuing his studies on the question of orientation, Haidinger gets the opportunity to describe yet another magnificent example of a meteorite shaped by a stable atmospheric flight. In 1868 a 2.7kg urelite dropped from the sky in the Province of Assam near Goalpara in India. Haidinger had access to first hand ressources. These included a gypsum cast, a 164g fragment of the stone, the detailed report by Dr. Th. Oldham, the descriptive drawings done on behalf of the curator of the Vienna collection, Stoliczka, in three perspectives and last but not least the drawings which were fabricated on behalf of Dr. G. Tschermak. The latter was the director of the Vienna Museum at that time. The drawings ordered by Tschermak are displayed above and below in half their origal size. They were accomplished by the famous drawer and litographer R. Schönne. Better than any conventional photograph they express the character, shape and texture of the Goalpara stone in unmatched precision. 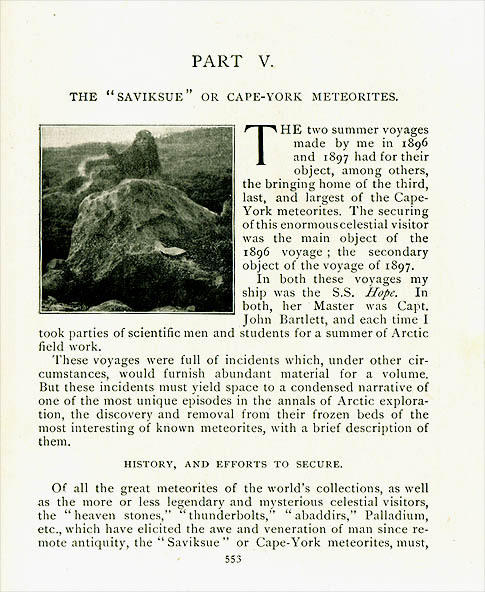 Haidinger’s description of the meteorite lasts three pages. It demonstrates how to evoke a lucid and perfect picture of a complex three dimensional object only by the definite and uncompromising use of language. He assigns brustseite and trailing side and explains the angle of the orientation and its shifting by giving the reader a 360 degree description of the double cone’s profile. 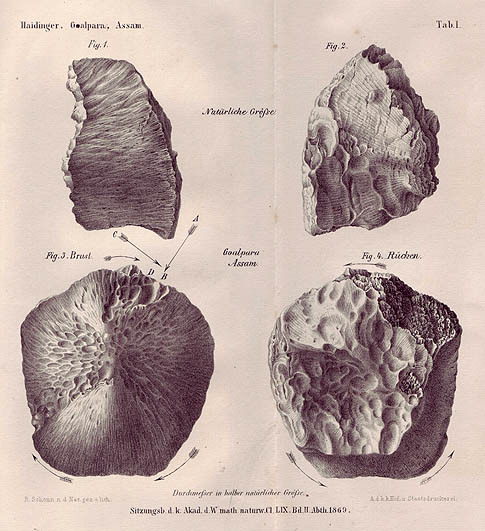 Haidinger compares the Goalpara meteorite with meteoritic masses of similar shape, for example the Durala stone described by Nevil Story Maskelyne (The London, Edinburgh and Dublin Philosophical Magazine, Ser. 4. Vol. 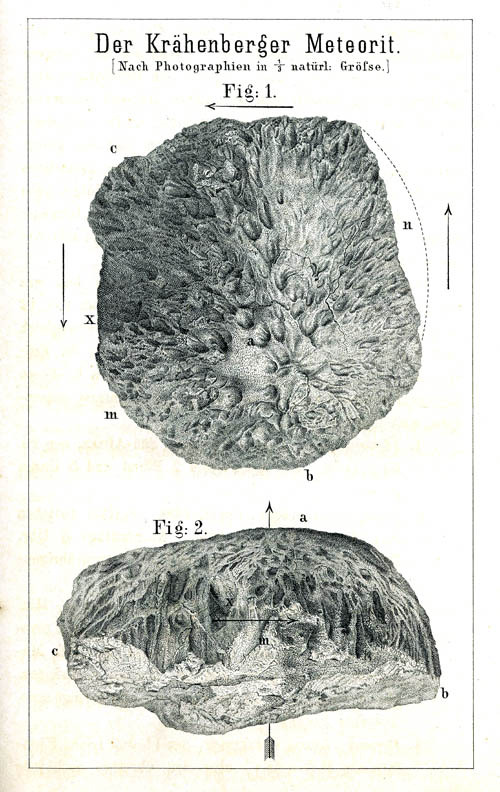 XXV, 1863) and the Karakol meteorite as described by A. Goebel (1840). While discussing other examples of oriented masses, Haidinger corrects his earlier judgement on the directon of movement of the Gross Divina meteorite. He had interpreted the thick flow lines and melt ridges on the broad conical end as indications for lesser pressure and therefore assumed that this side was the trailing edge. It was only by the help of the Goalpora stone with its pronounced flow features on the obvious brustseite that Haidinger realized his previous error. [In our opinion Haidinger still failed to determine the direction of rotaion correctly on both, the Gross Divina and the Goalpara stone]. Von Dr. G. Neymayer. In: XXVIII. & XXIX. 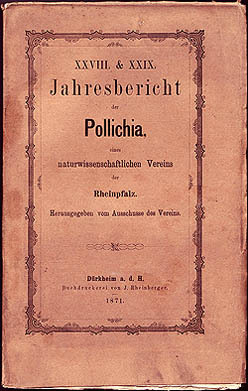 Jahresbericht der Pollichia, eines naturwissenschaftlichen Vereins der Rheinpfalz. Duerkheim 1871. Description on the fall and recovery of Germany’s aesthetically most appealing meteorite. The Kraehenberg meteorite is a witnessed fall from May 5, 1869. In order to demonstrate that a witnessed fall of a meteoritic mass is not a particularly uncommon event Neumayer lists another eight(!) falls that dropped within 12 months of the Kraehenberg fall in 1868 and 1869. Neymayer provides extensive eyewittness accounts and a calculation of the trajectory of the bolide. In the “Atlas of Meteors” of 1867 he found a meteor radiant in the virgo constellation that matched his calculations on the origin of the trajectory. This lead Neymayer to believe that the Kraehenberg meteorite actually represented matter of a comet. The Kraehenberg stone weighed 31 pounds and fell only eight meters from a group of farmers working on a field. A young girl rested in the shadow of a tree and according to Neumayer the meteorite impacted only two meters away from her spraying her with dirt. The farmers started to dig out the meteorite immediately and reported in unison that is was handwarm, but not hot, as could be read in later reports. Handwritten letter by Henry A. Ward, Ward’s Natural Science Establishment, Rochester, New York, to Dr. E. Cohen, University of Greifswald, Germany. December 12, 1895, 2 pages (a). 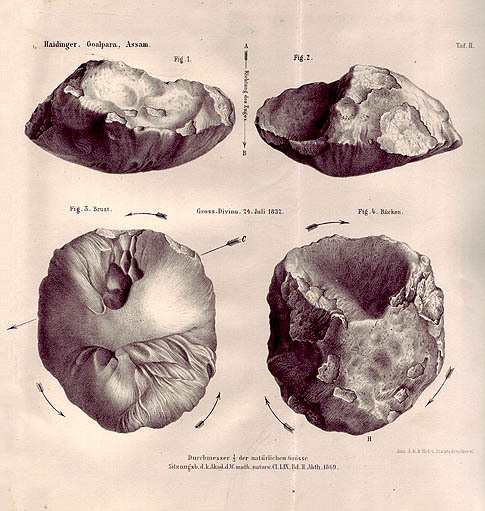 Includes “Illustrated Descriptive Catalogue of Meteorites”, Ward’s Natural Science Establishment Rochester, New York, 1892, 75 + 8 pages (b). Rochester, N.Y. February 1, 1896, 10 pages (c). Henry Augustus Ward, scientist, explorer, museum builder, founder of Ward’s Natural Science Establishment and one of the most important meteorite collectors of the 19th century, was born in Rochester, New York in 1834. He studied at Middlebury Academy, Williams College, Temple Hill Academy and Paris School of Mines. 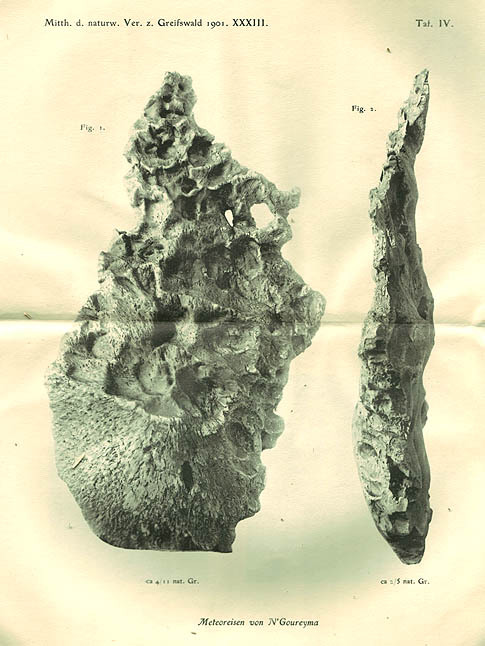 In 1860 Ward returned to Rochester after many years of collecting geological specimens in Europe and Africa. From 1860 to 1865 he taught natural science at the University of Rochester, and began to supply colleges and universities with geological cabinets. This work was the beginning of the Science Establishment. 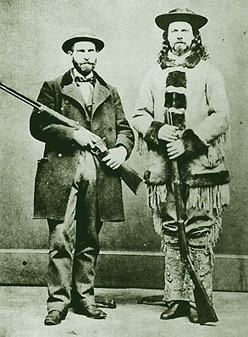 At Age 23, Henry Ward (left, with “Buffallo Bill”) was in Moscow, where he saw the remains of the great Siberian Mammoth and a collection of meteorites, both of which influenced his later collecting. From then on Ward never missed an opportunity on his various travels to chase meteorite falls and finds and to discuss the subject with curators and collectors. Back in the US Ward began to build up his own meteorite collection. 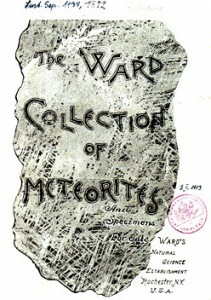 The Ward-Coonley Meteorite Collection became the largest in the world. It was later purchased by the Chicago Natural History Museum where it remains until present. Henry Ward was a distinguished, colorful and globe-trotting citizen and well acquainted with a number of contemporary Rochester citizens. The photo above shows Ward (left) together with William Cody, later known as “Bufallo Bill”, with whom Ward went on hunting expeditions and for whom he prepared a number of Bufallo skulls. Bufallo Bill spent a good deal of time discussing his plans with Professor Ward, and “it is possible,” writes Ward’s biographer, “that many features, if not the original conception of Buffalo Bill’s Wild West Show may have originated in the big book-lined second floor of Ward’s new house in Rochester. 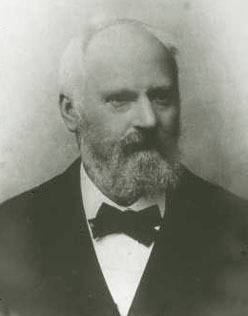 Dr. Emil Cohen (1842-1905) was a German mineralogist and meteorite expert, born in Jutland. 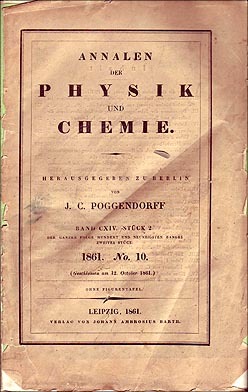 Cohen studied in the universities of Berlin and Heidelberg and from 1867 to 1872 was assistant in mineralogy in the latter university. He then went for a year and a half to South Africa where he conducted field work and began to build up an extensive collection of minerals and fossils. After devoting the following years to mineralogical studies and to the preparation of works descriptive of his African explorations, Cohen became professor of petrography in Strassburg in 1878 where he contributed to the growth of the famous meteorite collection of the Strassbourg University. In 1885 he was made professor of mineralogy in Greifswald. 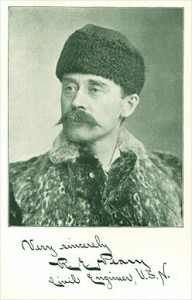 Cohen specialized on meteorites and became famous as the author of the three volume work “Meteoritenkunde” (1894-1905). For the first time in history, this work compiled the complete knowledge of the time on cosmic rocks and irons that fell to Earth. During his time in Strassburg Cohem catalogued the Strassbourg meteorite collection. Later in Greifswald, Cohen published numerous articles on meteorites including his “Verzeichnis der Meteoriten in der Greifswalder Sammlung”, to which Henry Ward refers to in his letter. In 1889 E. Weinschenk named the iron nickel carbide mineral “Cohenite” [(Fe,Ni)3C] after Cohen to honour his achievements in the field of meteorites. Ward’s letter to Emil Cohen like no other contempory documemt reveals the psychology and tactis of 19th century meteorite trades between US and European collectors (right image shows side 2 of the letter). 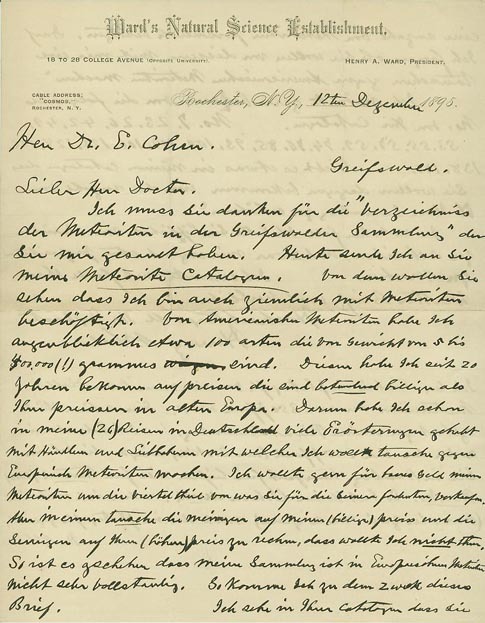 Ward writes to Cohen in fluent German which he may have learnt during his 24 visits of the country. He thanks Cohen for the sending of the catalogue of the Greifswald University meteorite collection and in turn includes a copy of “The Ward Collection of Meteorites” together with a price list in his letter. Amongst others, the Ward-Cohen correspondence prooves that the meteorite catalogues which were published in high cadence by Museums and curators in the 19th century had a major importance as trade catalogues. The letter itself was purchased by A. Gren on the Hamburg Mineral Fair 2007 from a book antiquarian together with a number of 19th century publications all bearing the stamp of the “Königlich Mineralogisches Instutut zu Greifswald”. These books obviously had been sorted out when the library of the institute was transferred into the main library of the Greifswald University. We can assume that the inventory at this time included a number of, if not all, books from Cohen’s personal library and that these ended up with the antiquarian. I see in your catalogue that you own some meteorites personally. May I ask if you want from these ones trade with me for US meteorites. I would like to get from you the following No. from your catalogue [list of catalogue numbers] Is there something in my catalogue that you want to get in order to to increase the number of your collection? meteorites by the discoverer himself. Peary explains how almost every expedition that went north in the area of Melville bay since 1818 tried to solve the mystery of the “Iron Mountain”. Since the iron that was discovered on Disco Island had prooved to be telluric the scientists doubted a meteoritic origin of the legendary Iron Mountain that only the Inuit had seen until then. 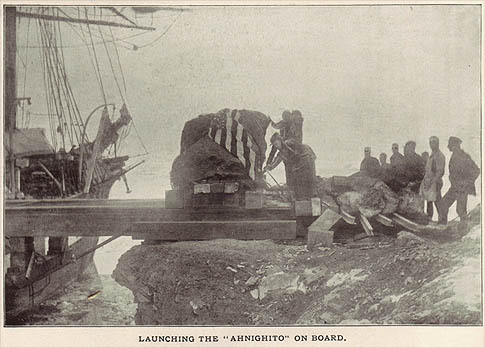 Peary made several unseccessful attempts to reach the northern shore of Melville bay until he ans his Eskimo scout finally reached the location of the meteorites by sledge in May 1894. In summer 1884 Peary made an attempt with his ship the Falcon to penetrate the ice of Melville bay and to embark the meteorites. This operation failed due to an unusual harsh summer in this region of the arctic circle and he could not get within 30 nautical miles of his “prizes”. Another attempt was scheduled for the summer of the following year. 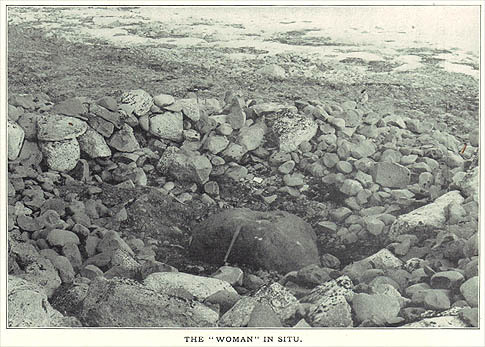 The Inuit told Peary that they themselves had made an attempt to carry away a section of the “Woman” a couple of generations before Peary arrived at the scene. A portion of the upper body of the woman had become detached because of the constant chiseling away of fragments over the centuries. When the head came off, a party of Inuit from Peterahwik lashed it to a sledge to carry it away in order to have a more convenient supply of the precious metal and to save themselves the long and arduous journey to Cape York and into Melville bay. “When well out from the shore the sea ice suddenly broke up with a loud noise, and the head disappeared beneath the water, dragging down with it the sledge and dogs. The Eskimos themselves narrowly escaped with their lives and since then no attempt has been made to carry away any but the smallest fragments of the heavenly woman”. 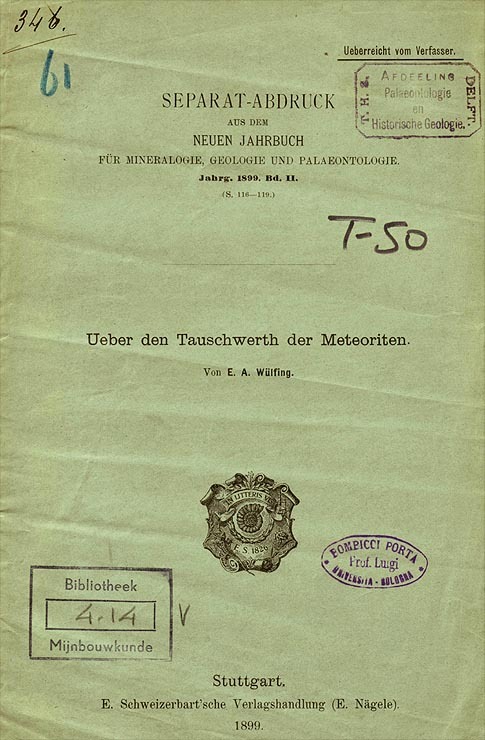 Wuelfing’s brief paper “On the trade value of meteorites” can be considered as one of the primary sources of information on the 19th century conditions of the inter-institutional meteorite trades. By naming eight factors determining the value of a meteorite such as total weight of the class, known number of owners, costs of recovery, probability of future falls of the respective class, individual weight and character, Wuelfing deduces a complex formula to calculate the individual value of a given meteorite. As so often, the icing on the cake in scientific treatises comes from the footnotes. There Wuelfing admits that some curators seem to have had problems implementing his sophisticated value calculation in their trades with dealers. On page 116 he quotes an English correspondant to Nature: “As regards the pecuniary values to be assigned to the meteorites, we are afraid that the dealers will eschew all such mathematical calculations as are suggested by the author, and will in each case get, as heretofore, what they can”. We also owe Wuelfing the documentation of a debate on a trade between a 19th century collector and the curator of an institutional collection (image above). 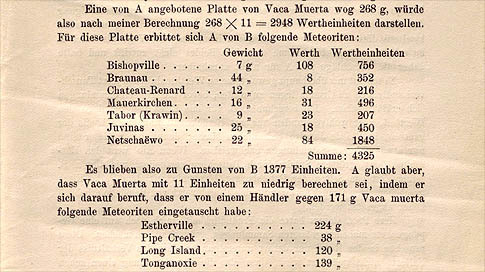 The collector offered a 268g plate of Vaca Muerte and the institutional curator sent him a list of meteorites (top table) which the collector thought would undervalue his offer. To proove his point he responded with another list that listed meteorites he had received from a different institutional collection and which he had traded for a 171g plate of Vaca Muerte (bottom table). Unfortunately Wuelfing does not report how the dispute ended. unweit Djenne, Provinz Macina, Sudan. Von E. Cohen. Mittheilungen aus dem Naturwissenschaftlichen Verein fuer Neu-Vorpommern und Ruegen 1901. XXXIII. Greifswald 1901. Account on the fall, recovery and analysis of the unique N’Goureyma iron by the grandmaster of iron meteorites Emil Cohen. The author describes the exceptional meteorite as an oriented shield and provides in total three photographic images that were taken on behalf of Minod. 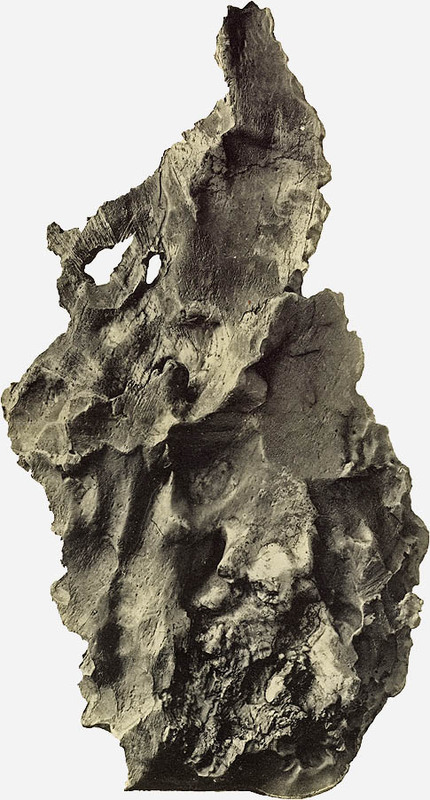 Because the chemical analysis of the meteorite had already been completed and preliminary results were published by Meunier, Cohen focusses on the shape and the reconstruction of flight and ablation processes that lead to the particular form of the meteorite. Cohen compares certain features of the fusion texture of N’Goureyma with those on Cabin Creek and he notes that on both meteorites the fusion crust is missing on the apex. He concludes that the blast of “compressed air” must have eroded the most protruding part of the apex free from any fusion crust. While some of Cohen’s explanations on the flight history of the N’Goureyma iron will find acceptance by today’s meteoriticists he is still convinced that due to the marginal thickness of the shield most of the mass, if not the complete meteorite, was molten or “softed” during the hot flight. Obviously Cohen was irritated by the ataxitic structure of the meteorite. In his conclusion he suggests that N’Goureyma originally entered Earth’s atmosphere as an octahedric iron that was subsequently to its entry completely molten during the atmospheric flight.